The fourth series of Star Wars themed Action Figures are going to be available this May exclusively at the Walt Disney World Resort in Florida and Disneyland Resort in California. 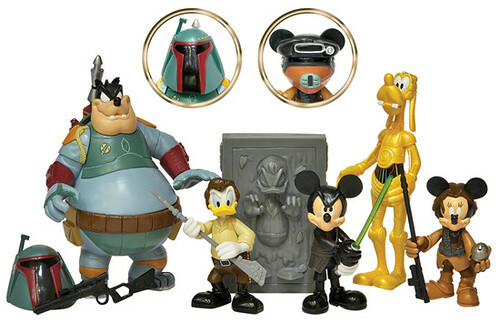 The figures feature Pete as Boba Fett, Donald as Han in Carbonite, Mickey as Jedi Luke Skywalker, Goofy as C-3PO, and Minnie as Princess Leia in Boussh disguise. The figures come with accessories and will retail for $8.95 each. The Disney Racers series will also have it’s fourth wave arrive at the parks this summer in June. This time around we get a Battle Droid, Plo Koon, Yoda, and a Clone Trooper versions of the popular cars. The Racers will cost $5.95 each. Guess we have something else to go shopping for while in Florida during Celebration V this summer! Previous post New Hasbro Mail-In Nehdar Vebb figure available!